Cute! I love that shade of green and it's extra special with the navy blue. This is really pretty Brandi! 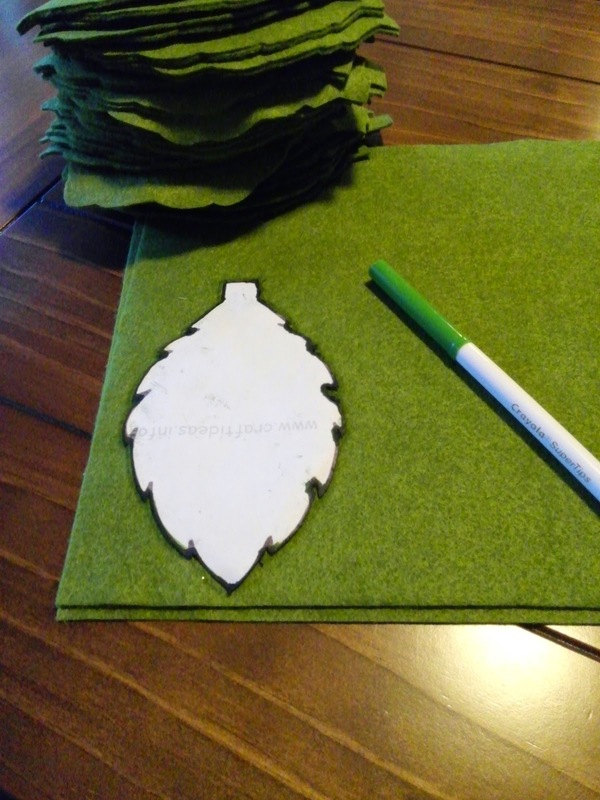 I have seen people decorate with magnolia leaves, but sadly there are none in my area...but now, with your felt trick I can fake it and have the look I crave! :) Thanks! Great minds think alike or crazy minds LOL! I made tie pillows yesterday. I love working with felt. Love your garland. I say leave it up! You never know. You might start a new trend. Have fun decorating! Oh, so pretty! I'd be tempted to leave it up all year, too! What a cute idea, Brandi! You always have the best crafting ideas! Really adorable. 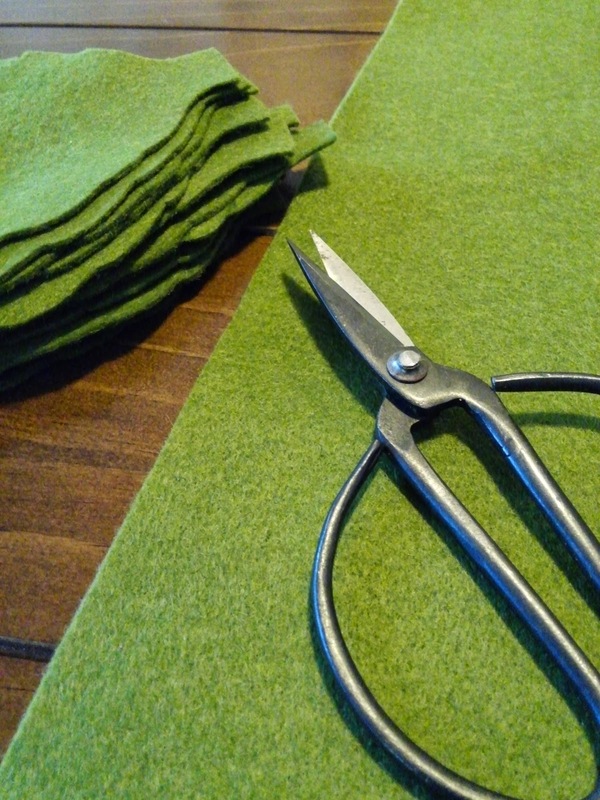 Those felt scissors are quite the concoction!! So pretty. Pretty and decorative. Very creative! and really cute, and the bows add a nice touch. I must say Brandi, green is not one of my favorite colors by a long shot but, the shade you have chosen speaks festivities to me and that's a good thing. The first thing I thought of was how well it would go with your blue decorations. Lo and behold the bows!!! I love creating with felt too! Such a cute idea! So cute and such a different idea. I might do one that matches my tree in purple. I'm really liking how you draped it over and down one side, very chic. Love the blue ribbon w/it too, looks great! Oh you patient lady to cut all those leaves out!! It looks so wonderful it was definitely worth the work! I think this is fabulous! I love that it can be used year after year. And the blue bows add just the right touch! Cute! Really love the lights intertwined through it. Hi Brandi, I really like this project. Your shade of green choice and the navy bows make it especially classy. I say leave it up forever, twinkle lights just make everyone happy. Brandi this is darling! I would want to leave it up all year too!! You are so clever!! Love the felt leaves and want to recreate it somehow. Ooh, I love felt too and this project is great. Nice work! How cute would these leaves be covering a wreath? Little red felt berries too! I think you may have just inspired me - thanks! Girl you are so creative ;) Love this and I also love greenery for the holidays! I always have real garland on my mantel for Christmas but maybe I'll have to try using felt. Thumbs up for this project! Oh my gosh, this is so, so cute! It wouldn't be a bad idea to leave it all year around, it looks gorgeous, and the addition of the mini lights was so clever. You have so cute ideas! I like your suggestion! This is such a pretty felt garland that you made. It is something that you can leave up until the new year. You did a great job, and the lights really add a special touch. I love green at Christmas time! Love your felt leaf garland and such a great idea. Thanks for sharing. I would be tempted to leave it up all year too. absolutely adorable Brandi! I can see why you want to leave it up year round! Very cute! Love those pretty mirrors too! LOVE this garland! What a great idea! They would even look beautiful as a table centerpiece. Perhaps if you double them for a fuller effect. Thanks for sharing!! Brandi, I was just looking at a really pretty pillow at Homegoods that had a wreath of felt leaves sewn on it. I loved it and now I can make my own!! I have tons of felt...why have I never thought to use it for home decor? Your garland came out beautifully....love the way you hung it on your doorway. I love this idea! I came over from Kelly's Korner- I'm #16! I love your leaf garland. It is so pretty and different from anything I've seen. I came over from Kelly's Korner. I'm #36! This is really great! I would love it if you shared this at my link party Welcome to the Woods Wednesday, over at http://backwoodbabies.blogspot.com. The party will be up, and ready Tuesday evening. Hope to see you there. I would for sure leave it up...it is gorgeous! What a great idea!